Deglazing a pan is where you simply add a liquid such as wine, stock or even water to a very hot pan – sounds a bit fancy doesn’t it! This helps to extract as much flavour as possible from the residue that is often left when the meat, etc has been cooked and removed. The brown bits stuck to the bottom of the pan are often called the ‘fond’ – this seems to fit with the French word for bottom! 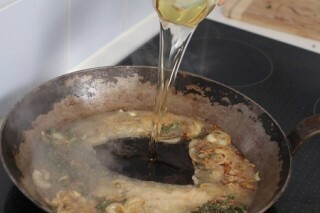 This extra liquid, often referred to as a pan sauce, can then be added to your sauces or gravy to increase their flavour. The flavour of the sauce from the plan is largely determined by the type of meat that was cooked. Make sure you drain of all the excess fats or oils before heating the pan as you don’t want any fires. Ensure your extractor fan is on full before you start as it will get quite smoky! It is very possible once you have deglazed your pan it will be a lot cleaner, which should help with the washing up!